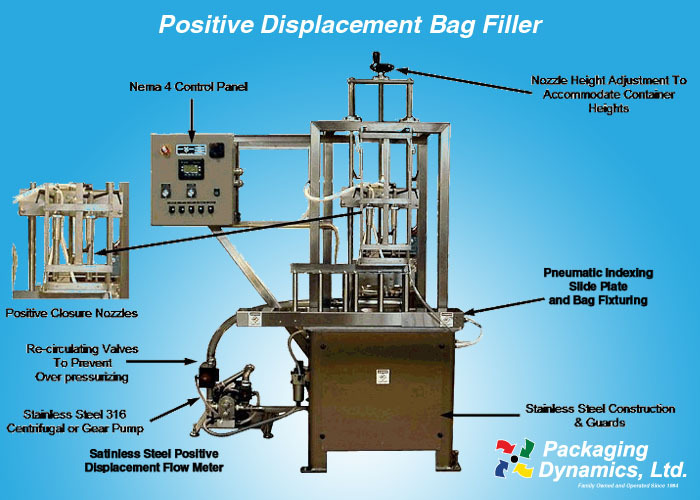 Automatic Positive Displacement Bag Filler - Packaging Dynamics, Ltd.
Amazing Accuracy & Control for Bags! Packaging Dynamics Ltd. introduces the Accu-Flo Liquid Filler (SLA-V2) which utilizes positive-displacement flowmeter technology. Our Positive Displacement Flow Meters use two rotating thermoplastic impellers driven by flowing liquid. Magnets imbedded in the impellers activate a non intrusive sensor which generates a pulsed output signal. Each pulse represents a known volume. This process allows our fillers to achieve a +/- 0. 5% accuracy and repeatability. The meter has only two moving parts, no bearings, no motors, no clutch or brakes and is programmed through our microprocessor touch pad for virtually any volume. This reduces the amount of mechanical moving parts and adds to the long term reliability of the system. The size and output of the Flow Meter ranges from 1/4″ NPT to 1. 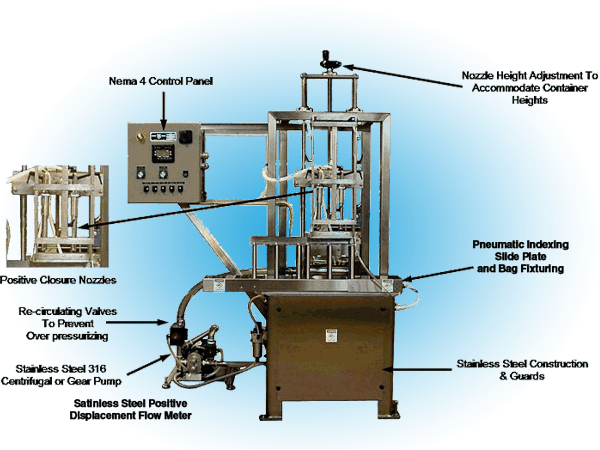 5″ NPT depending on the size of the container, the viscosity of the product and the speed required. This equipment is available from single to twelve head models and handles viscosities from water thin to gels and thick creams. Available in semi-automatic. 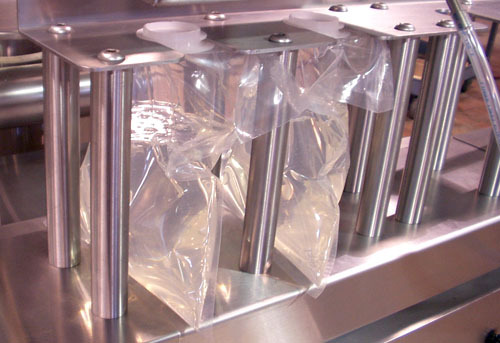 The Accu-Flo can be used to fill from small to large bags . Our easy to use pneumatic slide plate allows the operator to load and or assemble bags or containers while the system fills.